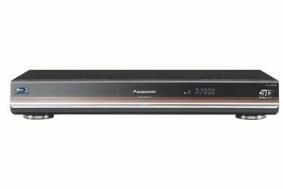 Panasonic reveals 2010 3D Viera TVs and 3D Blu-ray player | What Hi-Fi? The DMP-BDT300 is Full HD 3D capable and is equipped with a UniPhier LSI chip for processing Full HD 3D movies on Blu-ray. The player outputs images in 1920x1080 resolution in the so-called frame-sequential method, in which the images for the left and right eye are displayed alternately to create 3D images. Of course the player will also handle conventional 2D Blu-ray discs and DVDs. Adaptive Chroma Upsampling "reproduces colour in the finest details", claims Panasonic, and DVDs can be upscaled to Full HD 1080p resolution using the P4HD upsampler. Additional features include Viera Cast networking functionality, with content from new partners promised this year, plus DLNA capability and a Wireless LAN adapter. Twin HDMI and 7.1 analogue outputs are included as standard. And Panasonic claims a super-fast booting up time of just 0.5 seconds from standby to power on. Users can also watch content from their digital cameras or camcorders using the integrated SD card slot and USB port. Of course you'll need a 3D TV to enjoy 3D movies from your DMP-BDT300 player, and to that end Panasonic is introducing the Full HD 3D VT20 plasma series. There are two models, the TX-P65VT20B (60in) and and TX-P50VT20B (50in), both with 600Hz Sub-field Drive Intelligent Frame Creation Pro, 1080 lines Moving Picture Resolution and Infinite Black Pro. The top-of-the-range VT20 series has full Viera Cast networking functionality and has a metallic brown finish. C20 Series: HD-Ready, LCD range in 32in, 26in and 19in sizes. We'll be reporting live tomorrow from the official Panasonic press launch in Munich, so check back here on whathifi.com for UK prices and release dates, and follow us on Twitter for up-to-the-minute news.